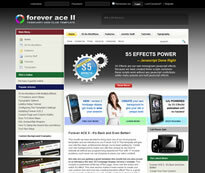 A year ago, Shape 5 released Forever ACE - today they release Forever ACE 2, an up to date, filled with loads of features theme, perfect for a news or review site that wants some lovely frontpage features. When I say news or review site I really do mean this - it's a great theme for a site with loads of content and while it comes with loads of features and is set full of functionality - it doesn't look too heavy. Last year, when the first one came out, I was going to use Forever ACE on a new project but that project never took off, but with this theme I might just start it off again - it's almost too good to be true. Anyway, don't just take my word for it, click here for a demo or more information.